Varies, especially between subspecies. Upperbody may have shades of yellow, brown, pale gray, and black. Underbody gray to yellow, often with brown markings. Body has 6-9 alternating, contrasting bands (pale and darker); tail has 7-10 bands. Walk, run. Relatively slow moving. Active during the day. Seek shelter at night. Adults: large snakes, goannas, large birds, dingoes, domestic dogs and cats. Juveniles/subadults: many reptiles, mammals, and birds. Long-lived. In managed care, live about 20 years; exceptional individuals over 30 years. For detailed information, click the tabs at the top of this page. 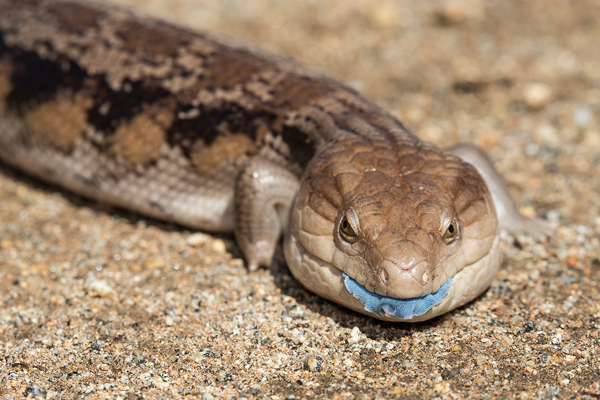 How to cite: Eastern Blue-tongued Skink (Tiliqua scinoides) Fact Sheet. c2018. San Diego (CA): San Diego Zoo Global; [accessed YYYY Mmm dd]. http://ielc.libguides.com/sdzg/factsheets/eastern-blue-tongued-skink. Thank you to Mike Swan for providing expert content review of this fact sheet. Mike Swan is a well-known Australian naturalist, writer, and photographer. Mr. Swan was a senior reptile keeper at Zoos Victoria for 19 years and was also involved with collections are the Melbourne Zoo and Healesville Sanctuary. Mr. Swan has authored and edited many herpetology books, including An Introduction to Keeping and Breeding Australian Reptiles, Keeping and Breeding Australian Pythons, and Snakes, Lizards and Frogs of the Victorian Mallee. Currently, he manages a 350 specimen reptile collection at Lilydale High School and is a project manager in interpretive design. Thank you to Dr. Samantha Price-Rees for providing expert content review of this fact sheet. Dr. Price-Rees conducted detailed studies of blue-tounged skink behavior and spatial ecology during her doctoral research at the University of Sydney, Australia. This research provided insight into the movements of T. scincoides in natural habitats and for demonstrating the impacts of toxic, invasive toads on blue-tongued skink populations in northern Australia. Dr. Price-Rees is now a professional landscape photographer. Many thanks to Jennifer Hardell, Animal Handler at the San Diego Zoo Safari Park, for sharing her knowledge of blue-tongued skink husbandry for the Managed Care section of this fact sheet.